The Olympic Decathlon tests a wide range of physical skills, on the track and on the field, to separate the “best athletes” from the rest of the field. In this 20/10 Puzzle Decathlon, author sought to test a range of mental skills to separate the “best puzzle solvers” from the rest of the field. The 20/10 Puzzle Decathlon consists of ten puzzle types; each type is represented by two classic”puzzles – an “easy” and a “hard” of the style – as well as one “mutant” puzzle, a variation that will require some unfamiliar thinking. In total there are 20 classic/10 mutant puzzles. All of the “easy” puzzles will be worth 15 points each while the “hard” and “mutant” puzzles will be worth 30 points each, for a total of 750 puzzle points. The test will last for exactly 120 minutes. The 9 or 10 requirement at the top is meant to not overly punish a solver who makes a single answer entry mistake, so it is recommended solvers still try to get all 10 types and not just 9 because of this possibility. Note that the identity (easy/hard/mutant) of the solved puzzles does not matter for the bonus. Someone solving all 10 easy puzzles across the ten types would qualify for the same first 150 point bonus as someone who solved 4 mutant, 3 hard, and 3 easy puzzles, except the second solver will have earned more overall points because of solving more valuable puzzles. Solvers who finish early will also earn a total of (# of correct puzzles – 20) points per minute saved, up to 10 points per minute. Thomas Snyder is a 2-time World Sudoku Champion and 5-time US Puzzle Champion. He has authored 4 books of puzzles, including the recently released TomTom Puzzles. You may start "20/10 Puzzle Decathlon" any time during the 48-hour period listed above. 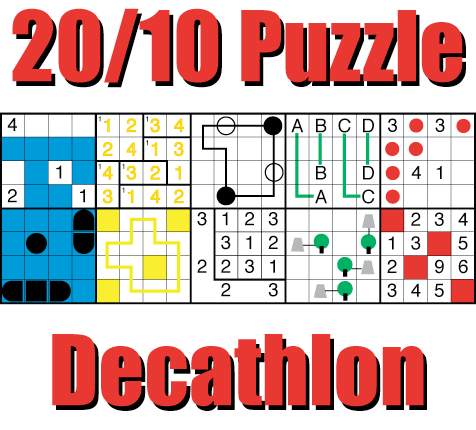 Your timer will start when you click "Start 20/10 Puzzle Decathlon" — then you will have exactly 120 minutes to solve and submit your answers. A timer will be shown the answer page with the remaining time. We puzzlers in Bangalore are planning to meet tomorrow and give this test offline. Looking forward to this test. Very excited for giving this test offline.